Make the best first impression you can with our stunning leather portfolios. 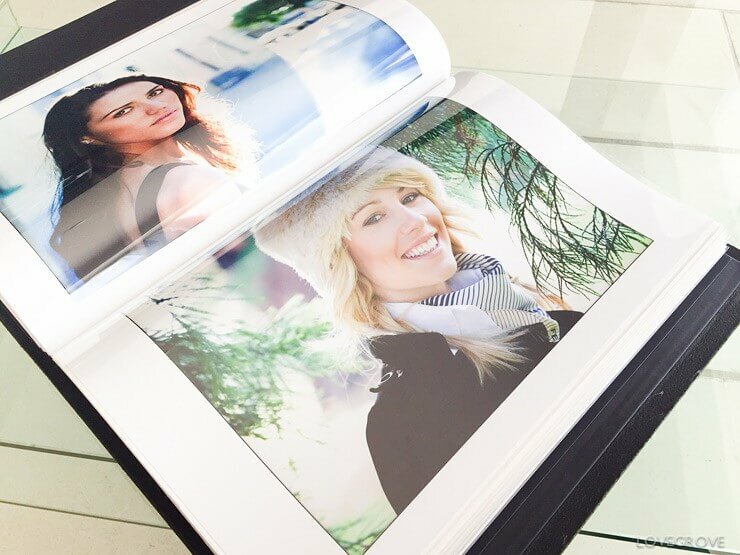 Made from a single piece of sumptuous high quality leather, they offer a beautiful and professional approach to display your photography or artwork, all contained in a pillar and post system rather than the usual ringbinder. (Please note that it is not possible to swap this system as inserting a ringbinder is not possible.) 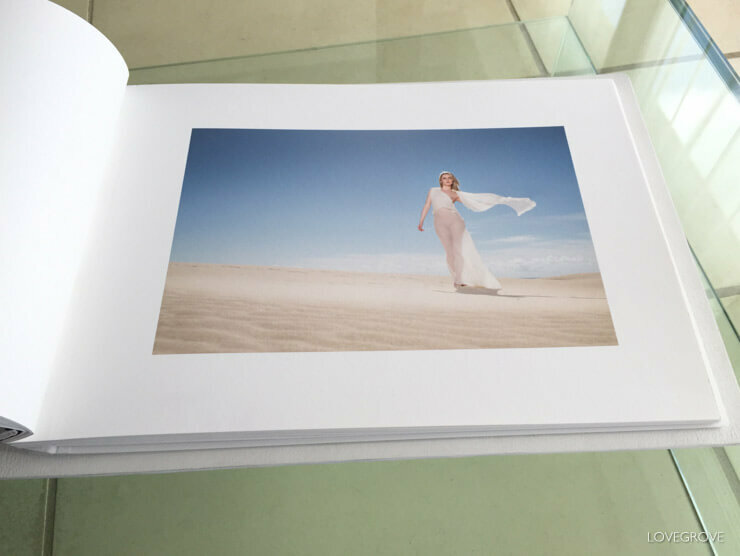 Portfolios are available in a wide variety of colours and sizes, in both portrait or landscape orientation. You can even personalise your leather portfolio with your name or company logo. Each display folio can comfortably hold up to 40 sleeves (double-sided) in their normal guise. Larger capacities are available upon request. Please take a look at all the features and customisable options in our step-by-step portfolio builder below. Normal turnaround is usually within 7-10 days. If you have any questions please contact us here, just give us a call or take a look at our FAQs page. Our leather portfolios are tailor made to order by experienced craftsmen using the finest materials and traditional techniques. Your leather portfolio cover is carefully chosen from some of the best 3mm top grain hide. 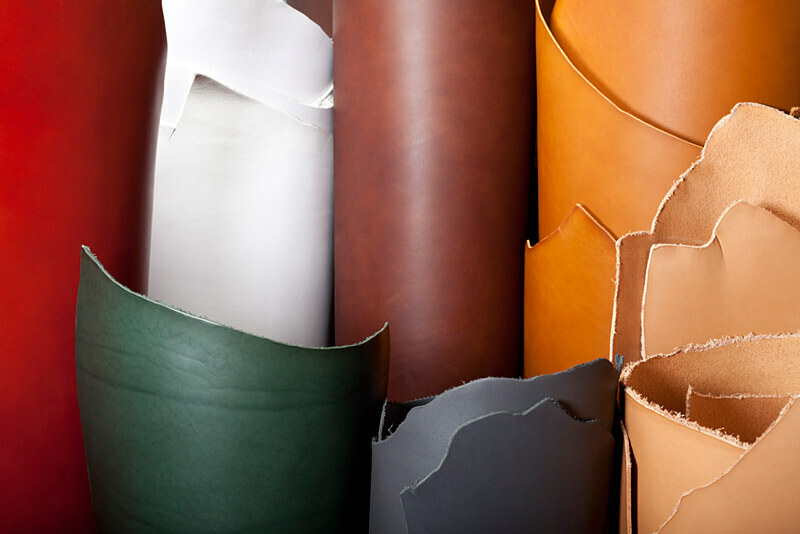 As leather hide is a natural product each piece is individual with its own character, making your portfolio unique – one of a kind. Your content is bound using an elegantly, simple “pillar and post” system. The binding is cleverly hidden from view with a hinged fabric panel that secures close with magnetic discs providing a clean, distraction free design. Your content simply slides over the metal posts in the binding and is tightened in place by a screw cap. To change, edit or rearrange your content you just open the magnetic panel, unscrew the pillar end caps and lift out your content. 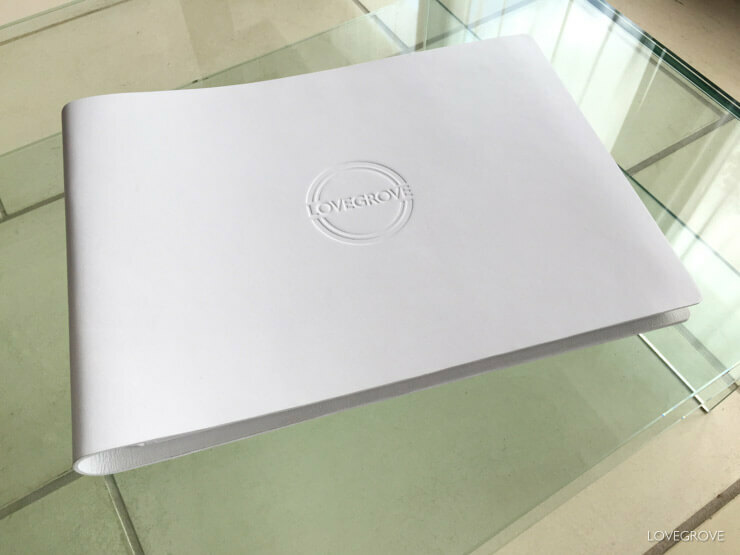 Please note that our portfolios, with their sandwich style binding, will not lay completely flat for double page spread designs, and it is not possible to to have a ringbinder inserted instead of the pillar & post system. To start building your portfolio hit the ‘Get Started’ button below and begin selecting your choices using the drop down options. More information can be found on our FAQs page. Our leather portfolio covers are available in a range of 10 tanned colours. Black and Dark Brown have a shorter tanning process making them slightly cheaper than the other available colours. It is possible to dye leather to any colour but this is only available when ordering six books or more. Feel free to request sample colour swatches. 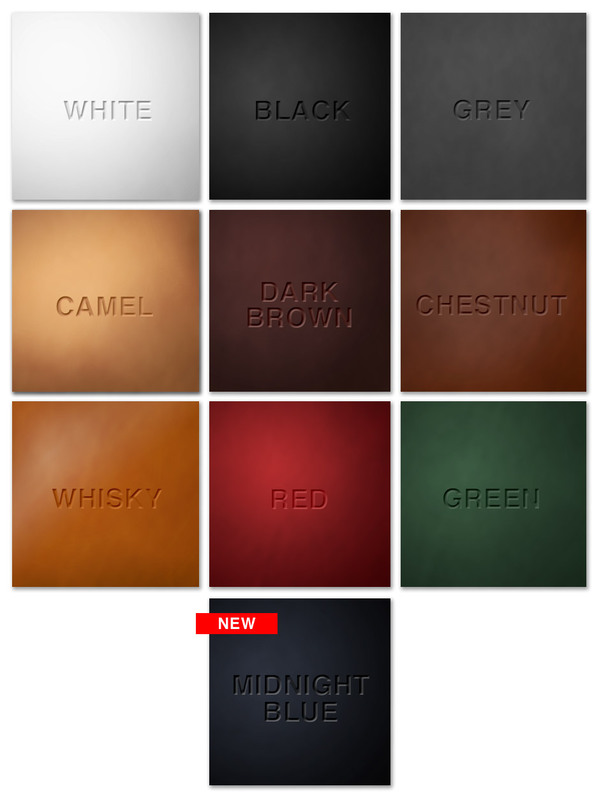 Colour (from top left clockwise): Red, White, Chestnut, Whisky, Camel, Grey, Green. Click the image to enlarge. 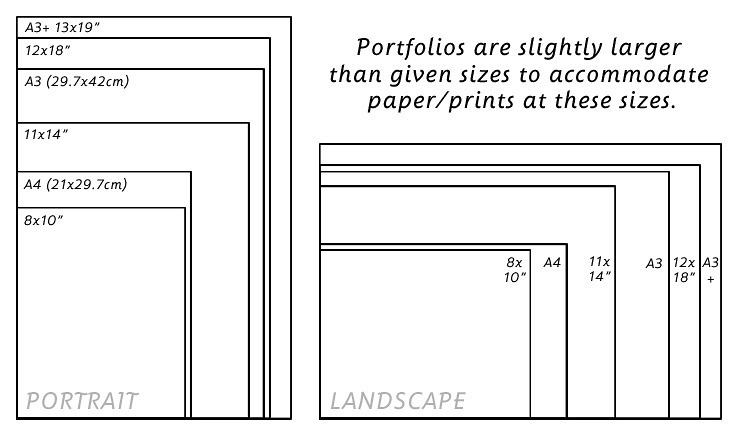 Your portfolio cover will be slightly larger than the “named” size to accommodate and protect any content you intend to insert. So if your content is A3, buy an A3 portfolio, and, if you wish, A3 sleeves to match. Every size is available in either landscape or portrait formats. If you have a non-standard size in mind please contact us to discuss prices. Leather portfolios are available in either portrait or landscape orientation. Portrait folios are tall and narrow and have the spine down the longest edge. Landscape folios are short and wide and have the spine down the shortest edge. Same as above but rotated 90°. The process we use is called blind debossing, a letterpress printing process (often misleadingly referred to as embossing). Debossing differs, as the design is pressed/indented into the surface without the use of an ink or dye. In order to achieve this refined and timeless effect a metal block of text is used or “made-to-order” custom logo block will be created for your portfolio. The bespoke option pays for a custom block to be made with your logo design or alternative font of choice. Once you have placed your order you will be asked to send us an image file of the design. The design will need to be a high resolution jpeg, tiff, png, psd or pdf. Ideally in black and white. Please note: We are unable to dye or tint the debossed area to a different colour. Reverse of the portfolio cover. Binding panel open. Shows the built-in magnets to access the pillar and posts. Black 12x18" portrait portfolio with sleeves. Close up of binding with sleeves. If you chose a standard option you can enter your personalisation text at the checkout stage. We use "Times" as our standard serif font. We use "Helvetica" as our standard sans-serif font. Once you've completed checkout please contact us to request our email address for your logo/image. (Due to SPAM issues we do not show our email address on this site). We accept high resolution jpeg, png and tiff file types. Ideally the file should be black and white and at least 300dpi. Please contact us if you need any help. Sleeves are the most popular option to display and protect your content. Made from crystal clear archival quality polyester, they are specifically made to fit your leather portfolio. Sleeves come with either black or white removable inserts depending on your preference. Your work simply slides into place from the top or bottom. Your content can be displayed on both sides of the sleeves and are clear from edge to edge. Each folio will naturally take up to 40 sleeves (80 prints) in their normal guise. Larger capacity portfolios are available upon request but you should be aware that this will become a very heavy portfolio. Our sleeves are only designed to fit Lovegrove supplied leather portfolios. Crystal clear archival quality sleeves to protect your content. If you don’t need sleeves, leave the drop down menu below in its default position. Additional or replacement sleeves are available here. The scoring template kit is required if you intend to go for a sleeveless option. The kit includes a simple cardboard scoring template, hole punch and scoring tool. Different portfolios will require different types of hole punch (see below). *Sold separately. A standard 2-hole office hole punch is suitable. These can be bought separately from any good stationers. This kit is only required if you plan to insert your work or exposed prints without the use of sleeves. Inner covers are like an extra protective page, bound by a cloth hinge with pre-punched holes. They come in pairs, one for the front and one for the back. They are suitable for leather portfolios both with and without sleeves. They are made from either black card or frosted semi-translucent polypropylene. These are highly recommended as they add extra support to your cover and help to protect your first sleeve or print from unwanted scratches and general wear. For leather portfolios without sleeves we recommend you use frosted inner covers as the black card may transfer dark fibres onto the first print over time. A pair of pages with cloth hinges and pre-punched holes to put straight into your portfolio to help protect the first and last pages of your portfolio. Additional or replacement inner covers are available here. Add a useful inner back pocket to your portfolio to hold business cards or loose sheets of paper etc. Added onto the supportive back panel featured in all portfolios, pockets are available in two sizes – business card size or full width. *Pockets and back panels are black (or white for white folios) and only available when ordering a portfolio cover at the same time.